When the UO administration wants the public to know things that make themselves look good, they’ve got a well paid team of strategic consultants like Tim Clevenger ($195K), Tobin Klinger ($115K), Ann Wiens ($110K), Julie Brown ($91K) and Jennifer Winters ($68K) to write up some spin for “Around the 0”, spam the faculty and student email lists, and try to find a reporter to write a puff piece with the administrator’s name prominently mentioned. Four weeks ago I made a public records request for the HLGR invoices for its work bargaining against the GTFF. A week or so later Hubin’s PR Office said they would charge me $94.58 for these documents. I sent payment the following Monday, November 10th, and according to my bank that check has been cashed by UO. I’m still waiting for the invoices. The Oregon DOJ says that one week is normally sufficient time to produce public records. So Monday I’ll file another petition to Lane County Alex Gardner’s office, and another public records request to UO for the statements showing more recent bargaining costs. From what I can tell from other sources, Dave Frohnmayer’s friends at HLGR have billed UO about $250K for the GTFF bargaining so far. The damage to JH’s credibility and the trust of UO’s faculty and students? Priceless. The University of Oregon has received your public records request for “the six detailed HLGR invoices with transactions dates of 24-Sep-14″ on 11/05/2014, attached. The office has at least some documents responsive to your request. By this email, the office is providing you with an estimate to respond to your requests. The office estimates the actual cost of responding to your request to be $94.58. Upon receipt of a check made payable to the University of Oregon for that amount, the office will proceed to locate, copy, and provide the records you have requested that are not exempt from disclosure. Your check may be sent to the attention of Office of Public Records, 6207 University of Oregon, Eugene, OR 97403-6207. It took a few petitions to the District Attorney, but eventually Dave Hubin’s public records office handed over the accounting records on UO’s legal expenses, and I posted them here. 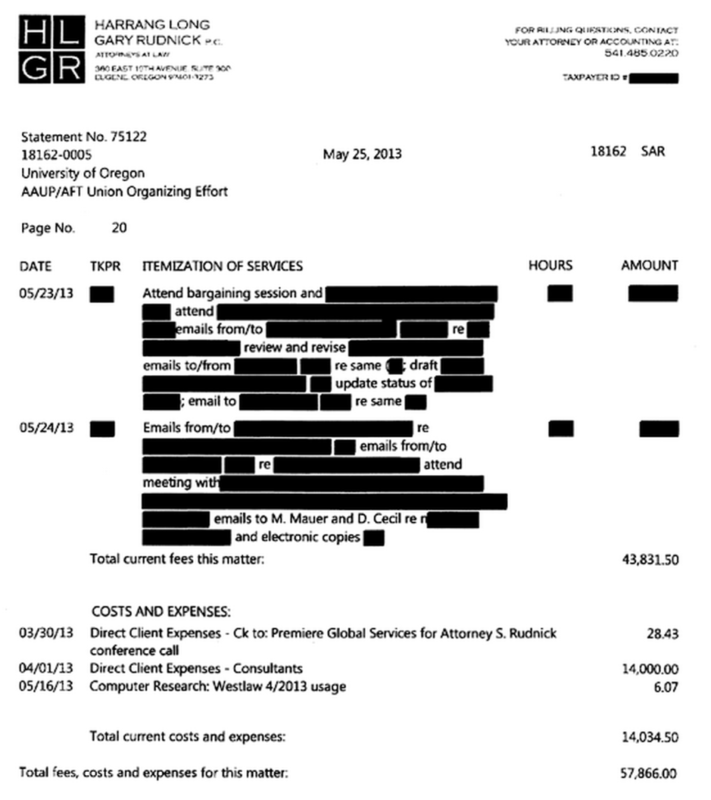 Some anonymous do-gooder put them into excel for me, and it seems that UO has paid $125K to HLGR’s labor lawyers Sharon Rudnick, Jeff Matthews, and Kate Grado, to try and prevent the UO grad students from getting ~$100K in sick leave a year. Expect more big bills in October and November. Tagged GTFs, Public Records. Bookmark the permalink. It’s reassuring to know I’m not the only one who has to put up with a lot of senselessly obstructive crap getting records from UO. How long does it take the DA to do anything about it? The DA is not helpful. Oregon has good sunshine laws, but they haven’t been enforced since Dave Frohnmayer was AG. Yes, I just said something good about Frohnmayer. You have paid for the redacted papers. That should give you, as well as the media standing. Perhaps, instead of suing the UO you, the media or the citizens of Oregon can sue the state directly? It would make for a very interesting case, one some out of work lawyers could cut their teeth on.